This cake may not look like much from my photo but the name says it all...lemon bliss! 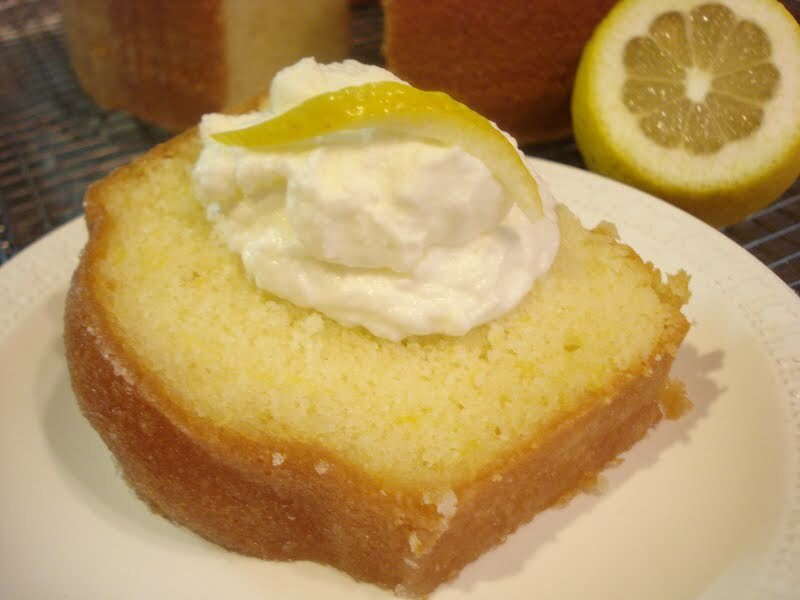 It packs a powerful punch of flavor from the lemons in the cake, using the zest, which has all the flavor, and a lemon glaze brushed on top of the warm cake. It's moist and tangy, with a tight crumb. As all cakes of this kind, it only gets better the next day or two, so go grab some lemons and make this cake! Serve it with whipped cream and maybe some fresh blueberries sprinkled on top. Yum! It begins, like most cakes, with creaming the butter and sugar til fluffy and light. 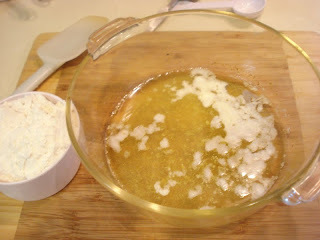 Then add in the eggs, then the dry ingredients, alternately with the milk. 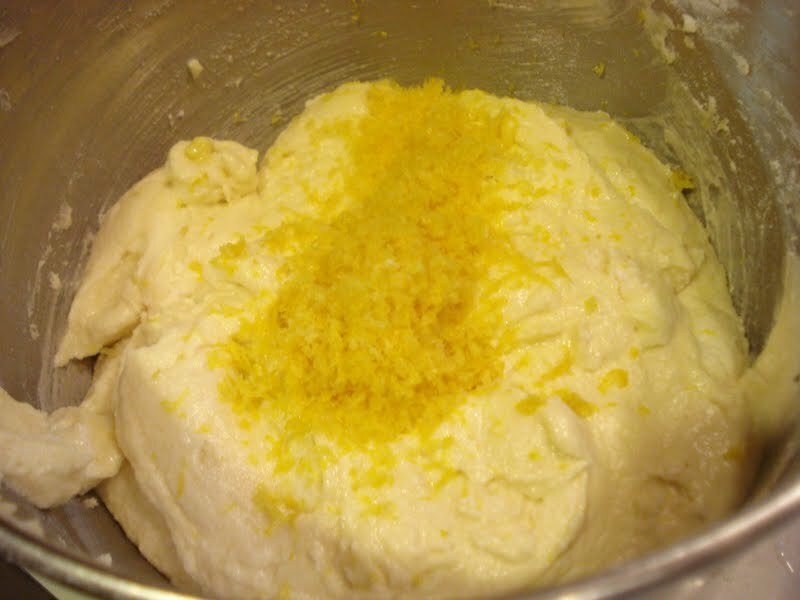 Throw in lots of lemon zest, which gives it it's great lemony flavor. Spoon the batter into your favorite bundt pan and smooth the top. Then brush on that lovely lemon glaze. Preheat oven to 350. Butter and lightly flour a 10" tube pan or a 9" to 10", 9 to 10 cup capacity bundt pan. 1. 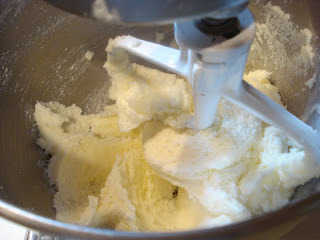 In a large mixing bowl, beat together the butter, sugar and salt, then cream til light and fluffy, about 2 minutes. 3. 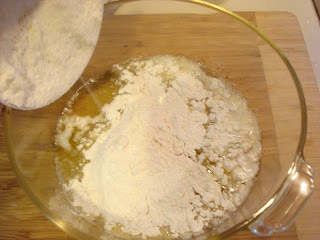 Add the baking powder, then add the flour alternately with the milk, beginning and ending with the flour. Mix til smooth. 4. Stir in the grated lemon zest ( or the lemon oil, if using). 5. Spoon the batter into your prepared pan and smooth the top with an offset spatula. 6. 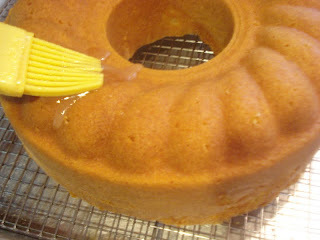 Bake the cake 55 to 60 minutes, or til a toothpick inserted into the center comes out clean. 7. 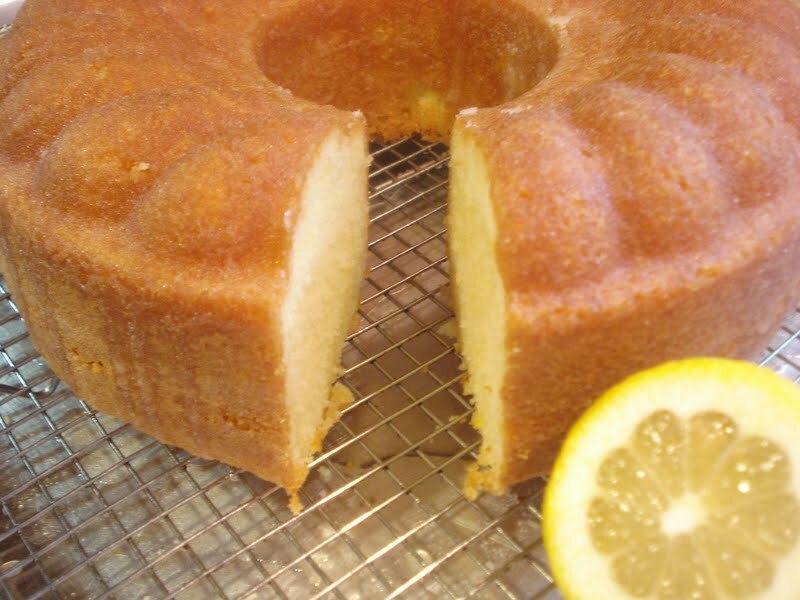 While the cake is finishing it's baking, make the glaze by combining the sugar and lemon juice in a small bowl. Set aside. 8. Once the cake comes out of the oven, set it aside on a wire cake to cool 5 minutes. Run a knife around the edges to loosen and turn the cake out onto the rack. Place another rach on top and turn the cake over so it's right side up. 9. Poke the hot cake all over the top with a cake tester or toothpick. Stir the glaze again, then brush the top with the glaze, letting it sink in, then brush on more glaze, continuing til all the glaze is used. 10. Allow the cake to cool completely before slicing. 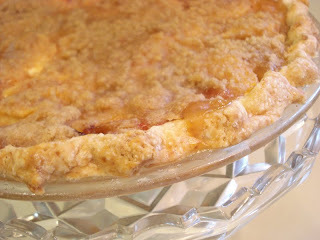 This is for anyone and everyone out there who has a fear of making pie crust. 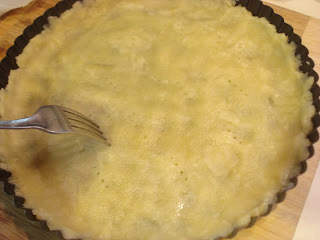 And even for those who have advanced skills in pie crust making...this crust is amazing! I read about it here a while back and kind of forgot about it. But then the other day, I got to thinking about my delicious lemon curd and decided to put it into a tart. 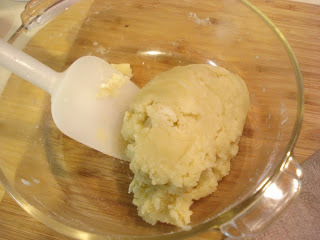 Making a dough from hot butter, rather than ice cold, disputes all the ideas about only using cold ingredients. I don't actually know why it works...but it works...and that's all I need to know! 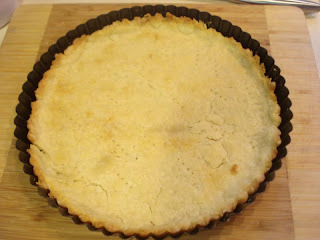 You can fill the tart with anything you'd like from a curd, like I did, to a pastry cream or custard with fresh fruit. I used my lemon curd recipe to fill the tart and then just piped some whipped cream on top. It's really the flakiest crust I've ever had and it's also the easiest crust I've ever made. So for all you bakers who are still buying a store bought crust because you're too nervous to try making one from scratch...give this one a try. You'll love it! Place the bowl into the oven for about 15 minutes, or til the butter begins to brown slightly and bubble. It should look like this, nice and melted. And stir til it becomes a ball. And that's pretty much it! Now, was that so hard? Dump the ball onto your tart pan (you might want to let it cool a little bit first), spread out the dough using the heel of your hand. Push it towards the edge and press the edge with your fingers. Save a little bit of dough, about the size of a marble, to patch any cracks that may occur after baking. Prick the dough with a fork in about 10 to 12 places. Bake 15 minutes and use the reserved dough to patch any sizable crack, if you have any. Fill with your fave filling, then decorate...and dive in! Makes one 9" tart or 3 to 4 tartlets( with removable bottom) or 9" pie plate. Note: My tart pan actually measured 9 1/2" and I think that's why my tart came out on the shallow side. This really wasn't a problem but if you use a pie plate or tart pan with a removable bottom, just know if it's not exactly 9" your tart may come out shallow also. I haven't made this recipe using tartlet pans so I'm not sure if it would make 3 or 4 but I bet they'd be darned cute...and delicious! 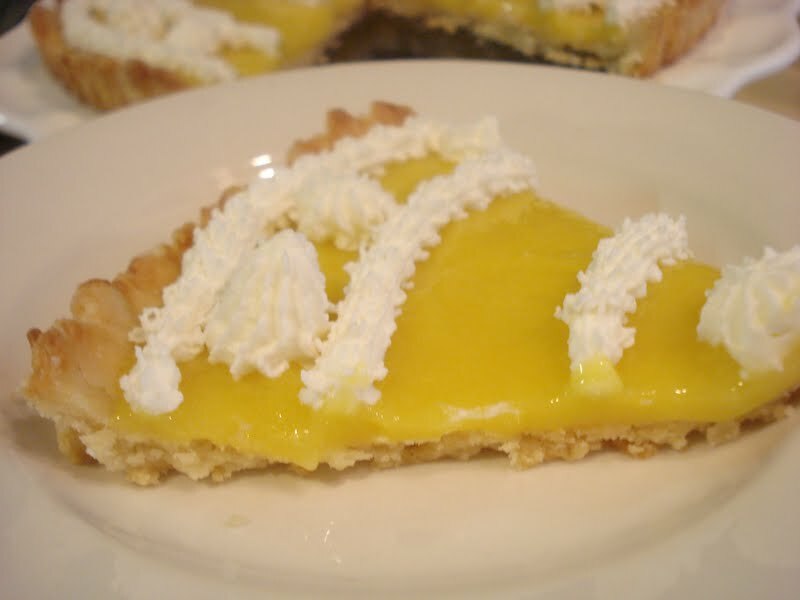 Also David says because small cracks in the dough are normal you'd be better to not use a thin custard filling. 1. 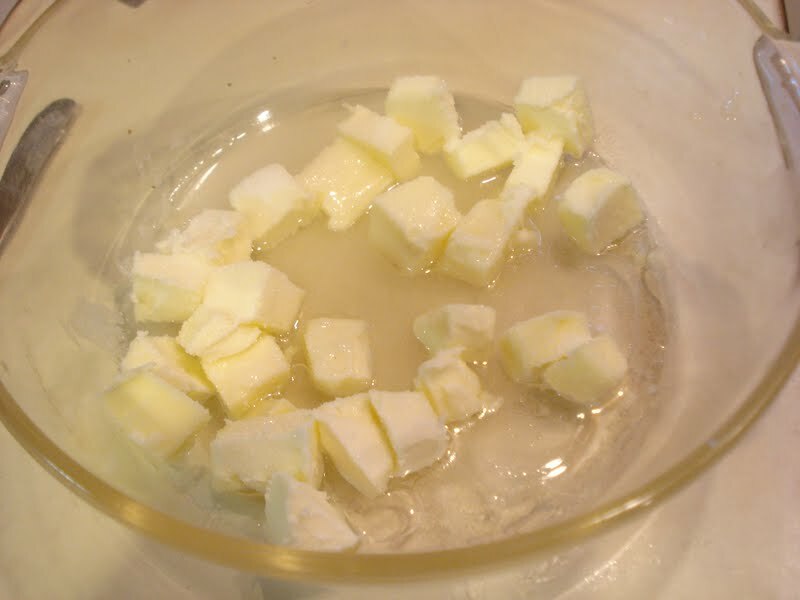 In a heatproof bowl ( I used my glass pyrex), place the butter pieces, oil, water, sugar and salt and place into the oven for 15 minutes, or til the butter begins to bubble and brown around the edges. Remove carefully. 2. Dump the flour into the melted butter mixture and stir into a ball with a spatula. 3. Place the ball into your tart or pie pan and, when cooled enough to handle, press the dough with the heel of your hand to spread out to the edges. 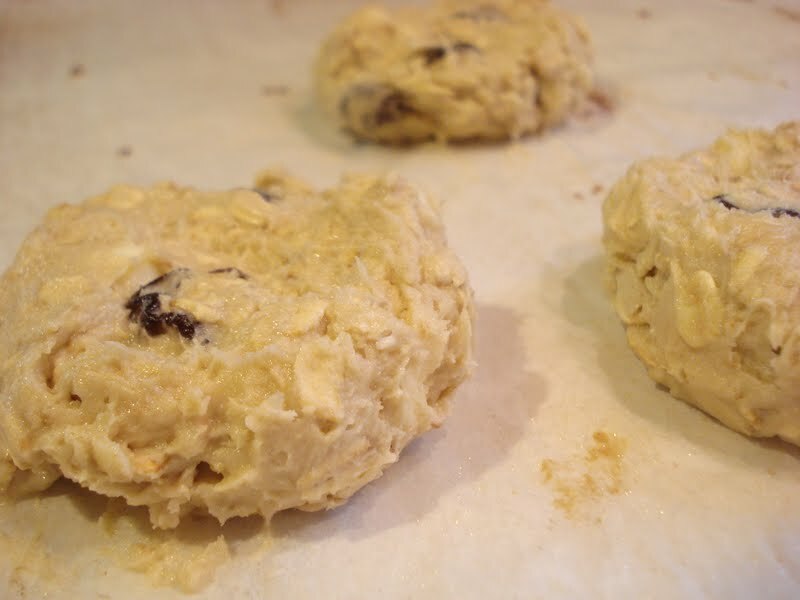 Use your fingers to press the sides of the dough . Reserve a small piece of dough, about the size of a marble, to patch any cracks later. 4. Prick the dough all over with a fork, then place back in the oven for 15 minutes, or til the dough gets a nice godlen color. 5. Patch any large cracks with the reserved dough piece. 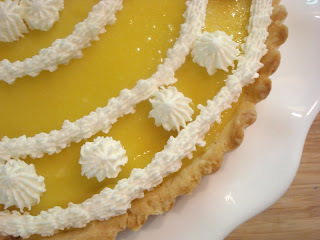 Let the crust cool completely before filling with your favorite custart and fresh fruit, pastry cream or, like me, most delicious lemon curd! I feel like I have this black cloud hanging over my kitchen this week. Well, okay, maybe that's a bit dramatic! But seriously, I can't seem to make anything come out right. 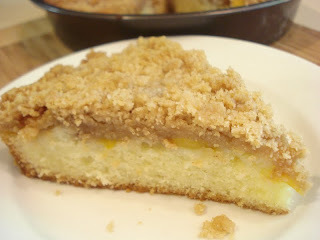 I made a stone fruit slump which came out okay but not fantastic...so why would I want to show you something that was just okay? Then last night I made a recipe from Cook's Country called Texas Style Blueberry Cobbler. Again..was just okay. That's not how I like my cobblers ( sorry Cook's Country!) Geez...what's going on? So today I decided to just make a new cookie recipe...all the while keeping an eye out for that cloud! But finally, success! 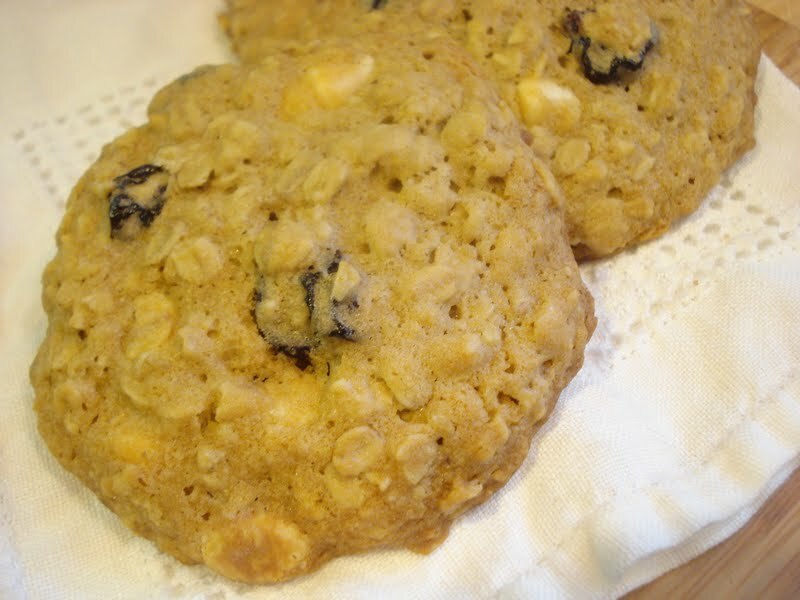 These cookies are from the book, "The Sweeter Side of Amy's Bread" and they're a wonderful mix of tart dried cherries and sweet white chocolate chips, a great balance and combination of flavors. Oatmeal in there helps add a nice texture. The book says to make them 3.5 ounces, but that's just too big for me so I made mine 2.2 ounces in size and they wound up baking about 3 1/2" in size. Perfect...finally! Begin by combining your dry ingredients in a medium bowl. 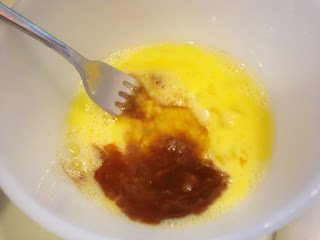 Then mix the eggs and vanilla and add to the creamed mixture. Add in the dry mixture and combine just til it's all well mixed together. Stir in the white chips and dried cherries. And scoop them onto your baking sheet, then flatten each one slightly. Then bake. 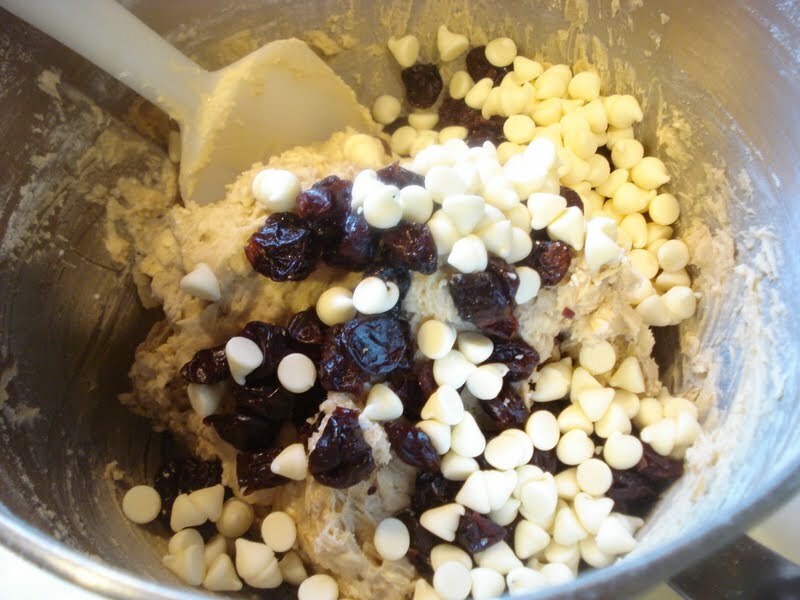 White Chocolate Cherry Chunkers, from "The Sweeter Side of Amy's Bread"
1. 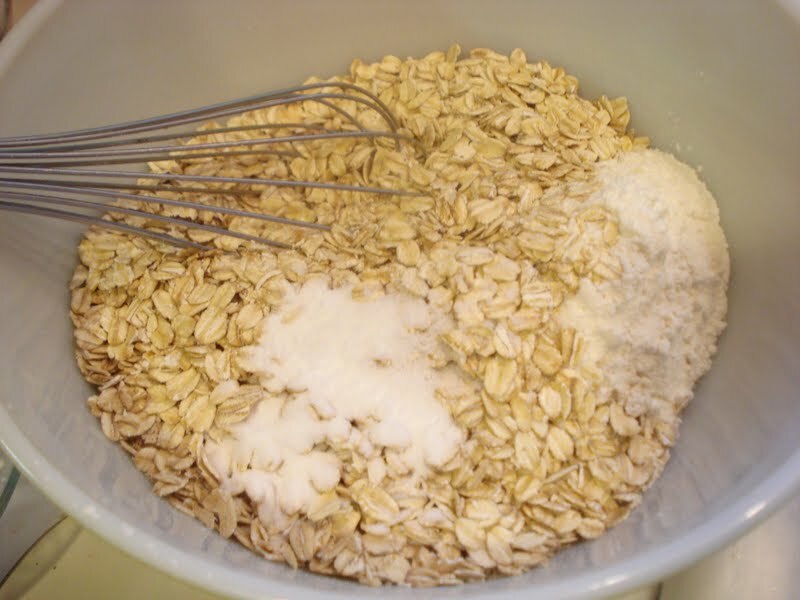 In a medium bowl, combine the flour, oats, baking soda and salt and whisk. 2. In a small bowl whisk the eggs with the vanilla and set aside. 3. 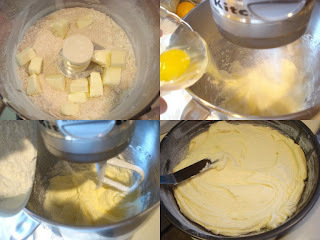 In a mixing bowl, cream the butter and sugars til light and fluffy, about 2 minutes, scraping the sides and bottom of the bowl often. 4. Gradually add the egg mixture til it's all combined. 5. 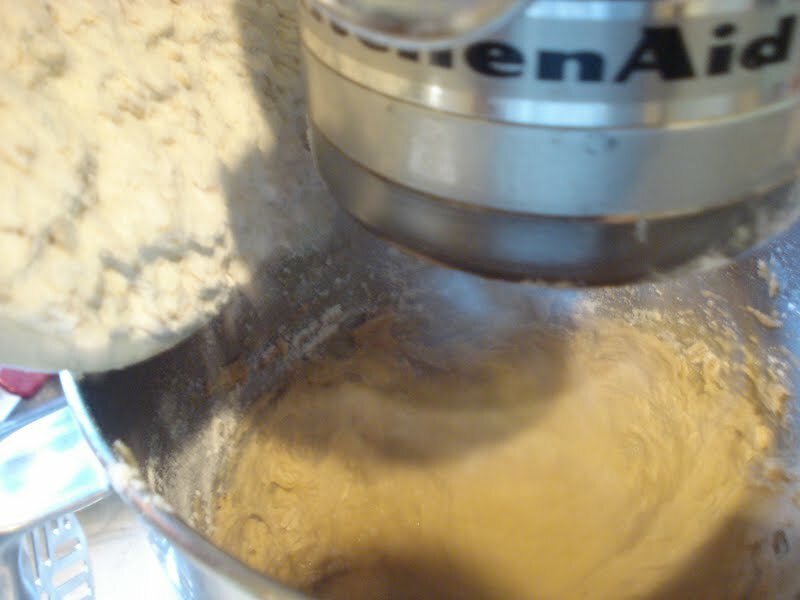 On low speed, add the flour mixture in stages. Mix only til everything is well combined, again scraping the sides and bottom of bowl. 6. Add the cherries and chocolate and stir gently to combine. 7. 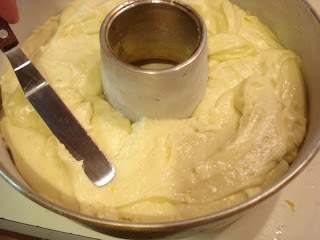 Scoop out the dough and flatten each to a thickness of approx. 1 1/4". 8. Bake 15 to 17 minutes, depending on size. They should be golden brown and baked all the way into the center. 9. Cool on sheet 5 minutes, then transfer to wire rack to cool completely. Still making my way through the load of peaches! This time we're going from Peach Crumb Pie to Peach Crumb Cake. 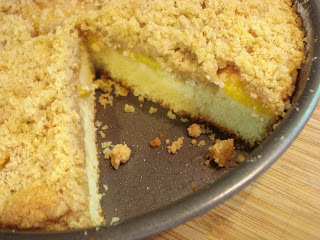 This cake is light and not too sweet...perfect for breakfast or a late night snack. Don't be shy with the peaches on top. I used 4 peaches but they were small. If you're using larger peaches, it's okay to just use 4 but if your peaches are on the small side, I'd go with at least 5 peaches. 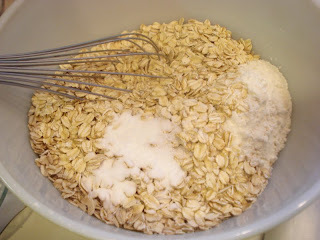 Make the topping first by throwing all the ingredients into a food processor and pulse til crumbly. Then make the cake batter. Then pour it into your prepared pan and spread evenly. Place the sliced peaches over top of the batter. 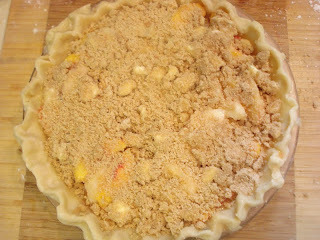 Then sprinkle the topping over the peach slices. Then bake... and cut yourself a nice big piece! Preheat oven to 350. Butter and flour an 8" round or square pan. 1. 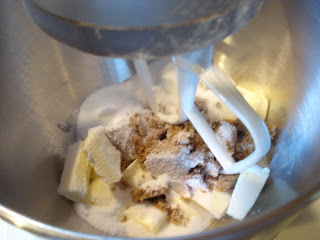 Topping: In a food processor, combine flour, brown sugar, butter and cinnamon and pulse til the mixture is crumbly. Set aside. 2. In mixing bowl, cream the butter and sugar til the mixture is light and fluffy, about 2 minutes. 4. 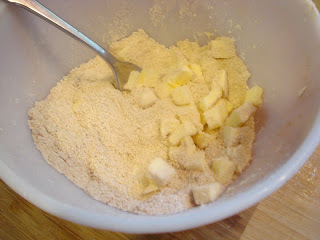 Add in the flour, baking powder and salt and beat the batter til just combined. 5. 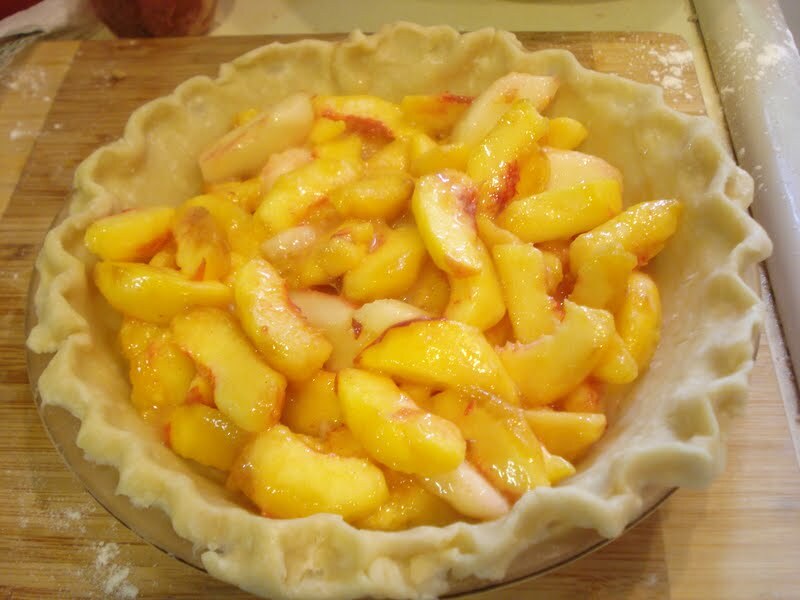 Spread the batter evenly into you prepared pan, then place the sliced peaches over top. 6. 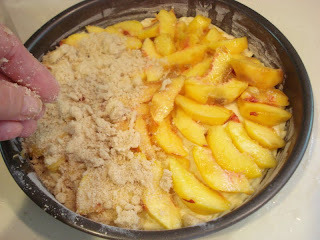 Sprinkle the crumble topping over the peaches and bake for 50 minutes to 1 hour, or til tester comes out clean. I did make this and this and this was great, too... have to make those again this year. 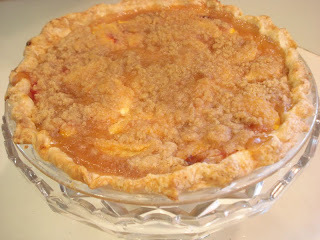 But this is the first pie I've made this summer so I figured it's a good time to share the recipe. 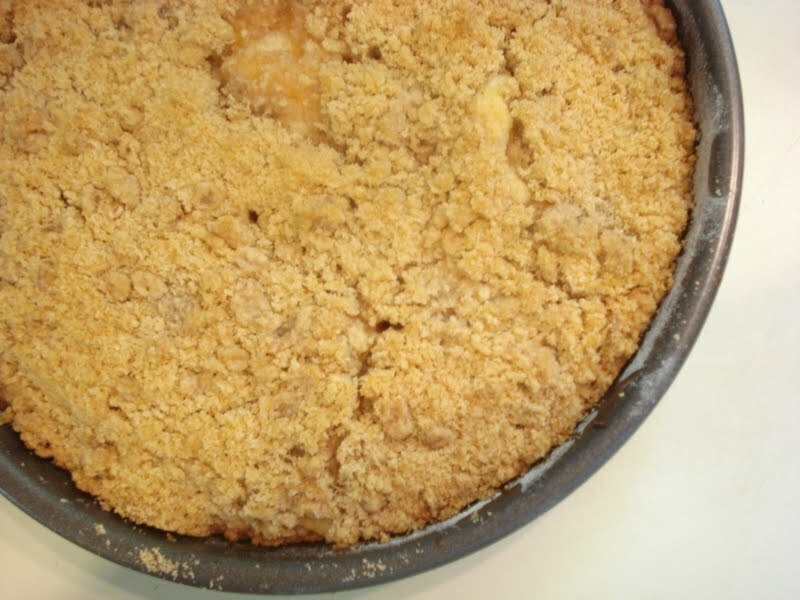 I love a crumble topping on a fruit pie. It's all about the crunch with me and a crumble top gives a little crunch and a bit more interesting taste. So go grab some peaches and make a pie! I made my crust the night before and placed it into the pie plate, wrapped well and put in the fridge to chill overnight. 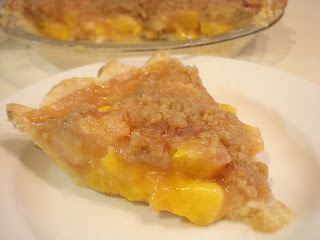 Then just slice up your peaches and mix the other ingredients together and spoon it into your chilled pie shell. The topping is easy to make. Just combine the flour, brown sugar, cinnamon, a pinch of salt and butter pieces and mix it together with a fork or your fingers. And bake the pie til it's nice and golden and bubbly. Unbaked pie crust for a single crust pie. I use this one every time. Make the crust ahead of time and place into pie plate. Chill in the fridge, wrapped in plastic wrap, for at least an hour or overnight. 1. Prepare crumb topping by combining all the ingredients in a small bowl. Set aside in fridge to chill while preparing the peaches. 2. In a large bowl, combine sliced peaches, lemon juice, sugar, cinnamon and cornstarch. Stir to combine well. 3. 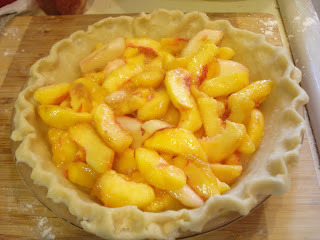 Spoon the peaches into the unbaked pie shell, including all the liquid. 4. Sprinkle the crumb topping over the pie and place the pie onto a baking sheet ( just in case any liquid spills over) and bake the pie for 10 minutes on 450. Then lower the oven temp. to 350 and continue to bake the pie for another 30 to 40 minutes, til it is bubbly and golden in color. 5. 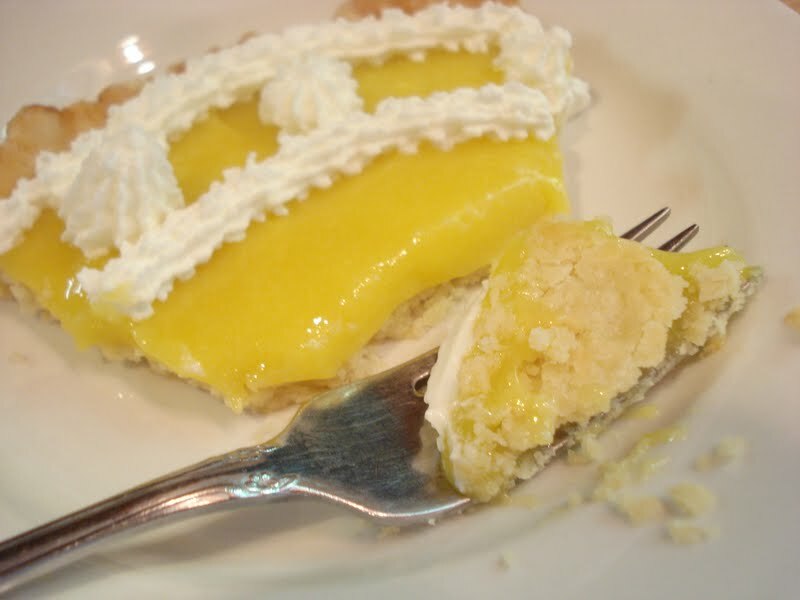 Allow the pie to rest at room temperature before cutting into it so the juices can settle. Grab the vanilla ice cream or whipped cream and dig in!